Probably the most versatile member of the PocketDock family (especially if you own a 5G iPod video or 4G iPod photo): The PocketDock AV. Incredibly compact, it is the most versatile, yet most mobile iPod adapter ever. It syncs, it charges, it connects your iPod to your stereo, it outputs your iPod video  to the big screen. All that with best possible quality, at once or separate of each other. The only thing it doesn’t do is make popcorn. Nobody likes cables (well, the cable guy does), but unfortunately we can’t do without them. SendStation’s design team took a whole new approach: Your PocketDock AV comes with the coolest cable you’ve ever had. USB, audio, composite and S-Video  all in one single, stunningly compact, 45 in. (115 cm) cable. Velcro cable strap included. Perfect for everyone on the road. Tip: Got a 15" or 17" PowerBook? 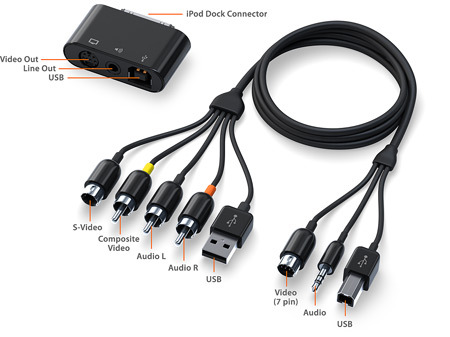 Attach the cable to the built-in 7-pin video connector and output your screen content to a TV. It’s great for watching DVDs in your hotel room! ... and picture clarity, too! Did you know that your iPod provides much better video quality than what you get from existing cable solutions using the iPod headphone jack? It’s called S-Video and is provided through the iPod’s dock connector connection for the PocketDock AV. Put simply, S-Video uses separate signals for color and brightness, whereas with Composite (from headphone jack) the whole picture is crammed into a single signal. 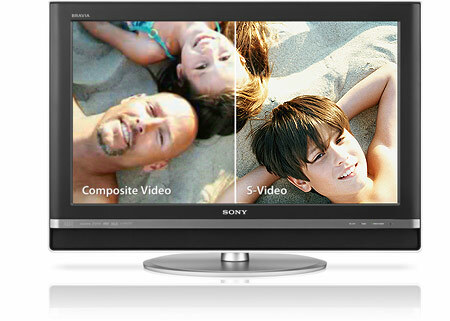 As a result, the S-Video image is much sharper, provides cleaner colors and reveals much more detail. PocketDock’s industry-standard 3.5 mm (1/8") stereo jack connects directly to the iPod’s line level circuitry  so it’s just like Apple’s Dock, but in a tiny, easy-to-carry package. This makes the PocketDock AV an ideal accessory for professional DJs, HiFi enthusiasts, and anyone else who would like to take advantage of the the iPod’s great sound quality anytime, anywhere, without interference and distortion from the headphone equalizer and amplifier circuitry. We know how annoying it is to constantly peel your iPod out of its case. That is why the new PocketDock AV has been designed to work with almost any iPod case: a built-in extension allows you to connect it to your iPod through the same narrow opening made for the standard iPod cable plug. PocketDock AV is compatible with any iPod with Dock connector (for details see list in right column). Get yours through our online store now for a new, lower price of USD 27.95. No need for Video output from your iPod? Looking for high quality audio only plus USB or FireWire? Check out the PocketDock Line Out USB or the PocketDock Line Out FW. 1. Video output supported for 5G iPod video and iPod photo only. Order your PocketDock AV anytime from our convenient online store. We ship world-wide. "...delivers everything you could hope for... Rating: 9 out of 10." 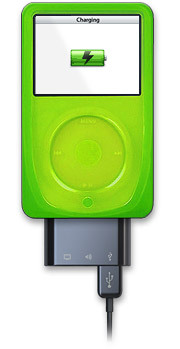 "...a handy asset to any iPod road warrior. Rating: Excellent." "If you want it all and you want it all-in-one, you'll love this product. Rating: Great." "...certainly a lot easier than carrying around separate adapters, docks and connectors... Rating: 5 out of 5." 3G iPod models (touch-wheel) DO NOT support USB charging NOR video output. Pick a PocketDock Line Out FireWire instead.